This is Room 15a. 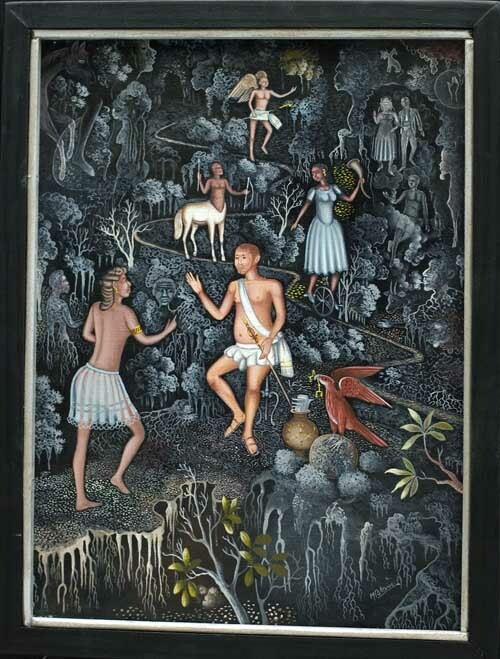 Haitian Art by Serge Moleon Blaise This is an archives page, for your browsing pleasure. Serge Moleon Blaise is the eldest of the four Blaise brothers, all well-known Haitian painters, and with Andre Blaise, is one of the two who are still alive. The other two were the internationally known St. Louis Blaise who died at age 38 of a rare blood disease (which was not AIDS) and Fabolon Blaise, maybe the best one, who passed at age 28 of a mistreated stomach ulcer . Moleon was born in Cap Haitien in 1954. His mother was a vendor of fruits and vegetables and his father was a mechanic and tax collector in the markets of LeCap. Moleon moved to Port-au-Prince in the early 70's and became associated with the Galerie Monnin. His work was shown at museums in Europe in the early 80's and a painting of his illustrates the front and back covers of the book. "Le Recontre De Deux Mondes" which was the catalog for the exhibit at the 1992 World's Fair in 1992 in Seville, Spain. 2009 $1500 Framed in painted wood.